A UK Parliamentary committee report published on 9 May 2016 calls for more "accountability" in extrajudicial executions conducted by the human rights-abusing British regime overseas. The report originates with the Joint Committee on Human Rights, and, although not condemning the state assassinations of British subjects without trial, makes a number of requests for the Government to explain itself. 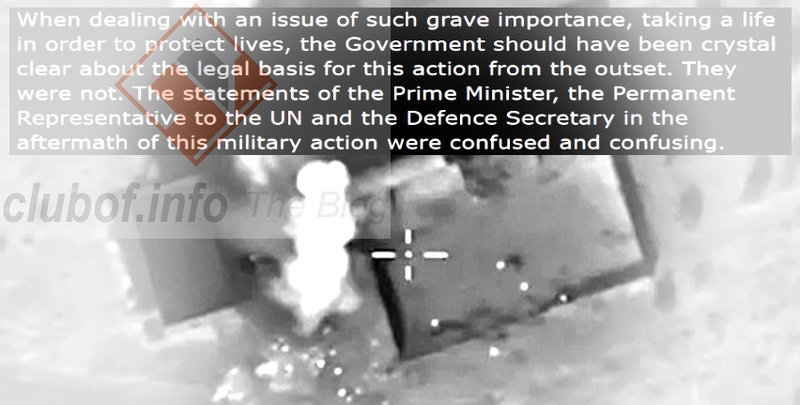 Questioning the legality of UK drone assassinations, such as the one that killed Reyaad Khan on 21 August 2015, the report requested to know "the legal basis on which [Britain] provides any help which facilitates the use of lethal force outside of armed conflict by the US, or any other country which takes the same or a similar view to the US... with regard to the use of lethal force". There must also be a mechanism for effective independent investigation capable of leading to accountability... Independent scrutiny is a means of ensuring that decision-makers keep to the relevant standards; is a safeguard against the danger of mission creep, when broad powers are exercised in ever wider circumstances; and gives the public the confidence that it is necessary to entrust such exceptional powers to ministers. With the so-called "war on terror" still a menace to human rights, many people still do not realize that the British regime, obeying the orders of the American regime, has carte blanche to kill anyone without trial if they are perceived or even mistakenly identified as a threat to the regime.